This week's post is by Skip, who posts at The Reading Ape. I only learned about Skip's blog after he commented on mine, but I really enjoy it. He not only reviews books, but also has many discussion posts; one you might remember is about the gender roles in blogosphere. 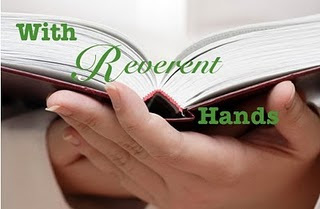 So I was quite excited to get his post in the With Reverent Hands series- and here it is! I'm sure you'll enjoy it, too. I first read it four years ago. I then proceeded to read everything else Salter wrote. 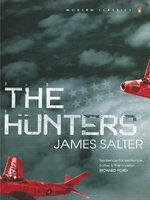 The Hunters is about a squadron of American fighter pilots during the Korean War. The protagonist, Cleve, is the acknowledged finest pilot in the group before a green, talented interloper threatens his standing. I loved reading about fighter pilots as a teenager and desperately wanted to be one. I read a bunch of pulpy books about Vietnam and World War II and loved, and still love, them. As I got older and my tastes matured, I moved onto to "serious" literature and there just wasn't anything out there that tickled both the sky-addled kid and the critic in me. When I read, The Hunters, it felt like the book had somehow been written for me. On its own, though, it is a masterpiece. Salter is generally considered the finest prose stylist of his generation and the descriptions of flight here are nothing short of astonishing. He balances the power dynamics of these supremely (and necessarily) egotistical men with the thrill and horror of aerial combat. It also has a dynamite and moving ending; one the four or five best I've ever read. He, like many of his age, was profoundly influenced by Hemingway. So if you liked A Farewell to Arms, you'll probably enjoy this book. Really anyone who cherishes beautiful sentences will be pleased here. I might also mention, since Father's Day is in the offing, that this would be a terrific gift for fathers and grandfathers, perhaps especially those who served in the armed forces. He would sometimes recall, as if it happened to another, person, the compulsion to press close to death, to feel the purity that followed. He had always been respectful of the inner conquests of men and the rarefied, ascetic world they occurred in. He had traveled the world for a while, accomplishing he was not sure what, unless it was that he had learned a little of silence and perhaps devotion. He knew a tranquility as times as a dream of deepest waters. If death were ever to touch him here, it would be with a gesture of equality, with fingertips only. In this high, sterile realm he would fight and, conquering, it seemed, become immortal. I have read a lot of books about the war, but never anything that sounds like this. I also am drawn in by the promise of beautiful writing and great characters. I am going to have to try to check this out sometime. Thanks so much, Skip, for sharing this one! I love these posts and the books that they highlight, ones we would never probably know about otherwise. I wonder if my father had read him - the books sound right up his alley. Looks interesting, I'll have to keep an eye out.